Fed Poly Nekede HND Weekend Program Payment List!!! This article is to help all newly admitted Higher National Diploma (HND) Weekend program students of the Federal Polytechnic Nekede. many times, students more especially, fresher do ask this question “What are the necessary payment to make after been admitted in Federal Polytechnic Nekede? I need And Estimate. Here is the answer to that question. These are the compulsory fee every Higher National Diploma (HND) Weekend program student must pay before he/she can be given Reg Number. This entry was posted in About Fed Poly Nekede, Admissions, School Fee and tagged Fed Poly Nekede, Federal Polytechnic Nekde on August 10, 2018 by Mina. Fed Poly Nekede Payment Schedule For ND Evening!!! This article is to help all newly admitted National Diploma (ND) Evening program students of the Federal Polytechnic Nekede. many times, students more especially. fresher do ask this question “What are the necessary payment to make after been admitted in Federal Polytechnic Nekede? I need And Estimate. Here is the answer to that question. This entry was posted in About Fed Poly Nekede, Admissions, School Fee and tagged Fed Poly Nekede, Federal Polytechnic Nekede on August 9, 2018 by Mina. This article is to help all newly admitted National Diploma (ND) morning program students of the Federal Polytechnic Nekede. many times, studets more especially. fresher do ask this question “What are the necessary payment to make after been admitted in Federal Polytechnic Nekede? I need And Estimate. Here is the answer to that question. This entry was posted in About Fed Poly Nekede, School Fee and tagged Fed Poly Nekede, Federal Polytechnic Nekde on August 9, 2018 by Mina. Fed Poly Nekede 2017/2018 Acceptance Fee Payment Guideline For Newly Admitted ND Evening Students!! This is to inform all candidates offered provisional admission into the Federal Polytechnic Nekede (NEKEDEPOLY) National Diploma (ND) evening program, that the procedure to complete the 2017/2018 acceptance fee payment has been released. All admitted candidates will be required to pay a non-refundable sum of twenty thousand naira (20000) only as Acceptance fee on E-Tranzact Platform at Federal Polytechnic Micro finance Bank within two weeks or have the admission forfeited. Registration must be completed within one month of acceptance of offer of the admission. The admission lapses upon non compliance with this time duration. This entry was posted in Campus Gist, Post UTME Updates, School Fee and tagged Fed Poly Nekede, Fed Poly Nekede 2017 Admissions, Federal Polytechnic Nekede, Federal Polytechnic Nekede Admission on November 2, 2017 by Mina. Tips About Fed Poly Nekede Post UTME Questions!! This publication is to enlighten all Federal Polytechnic Nekede Owerri 2017/2018 National Diploma (ND) Admission aspirants on how the Federal Polytechnic Post UTME Questions looks like and how to answer the questions. 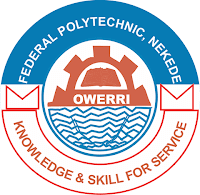 All National Diploma Admission Aspirants of the Federal Polytechnic Nekede are to take note of the following things about Federal Polytechnic Nekede Post UTME Questions. Exam Method: All ND Admission candidates are to take note of the exam method which will help prepare them ahead of the exam. this simply means, the system or way by which Federal Polytechnic Nekede conduct her Post UTME Screening Exam. The Federal Polytechnic Nekede Post UTME Screening Exam Method is therefore a PAPER AND PEN Exam Method. That is is to say, Federal Polytechnic Nekede, have not yet adopted the computer based test system in conducting their Post UTME Exams as done in other schools. Area Of Concentration: All Admission candidates of the Federal Polytechnic Nekede should beware of those who comes out of the social media or blog site to tell you that the Federal Polytechnic Nekede Post UTME Exam normally have Area of concentration, it is a lie. The Federal Polytechnic Nekede Post UTME Exam Questions normally come from different subjects both science and art. I.e, as science or an art student, you should study both your science related subjects and that of arts because the question comes from both science and art subjects. (A science student will see Literature, C.R.K and other Art Subjects together with that of the science though the questions from the Art subjects will be few and simple. Also, an art students will see Chemistry, Physics, Geography and other science subject questions, though that of science will be few and simple.) The essence of this, is to test students ability on fields). Exam Duration: All candidates should know that the post UTME Exam of Federal Polytechnic last only for 30 minutes. In this case, students are always advised to be fast. Question Number: Candidates are also to be aware that the Federal Polytechnic Nekede Post UTME Question Is 50 Questions in all. The questions comes from different subjects irrespective of your field. 6. Sitting Structure/Setting: Candidates are to know that they are going to sit 3 persons per seat. Normally, the seat contains 8-10 persons but for the purpose of the exam, candidates will sit 3 persons per seat. I believe with all this tips, All ND Admission aspirants of the Federal Polytechnic Can prepare theirselves ahead of the upcoming Fed Poly Nekede ND Post UTME Examination. This entry was posted in About Fed Poly Nekede, Campus Gist, Examinations, Post UTME Updates, School Fee and tagged Fed Poly Nekede 2017 Post UTME EXAM, Federal Polytechnic Nekede on October 21, 2017 by Mina.